Modern bohemians, Luxury vagabonds, Urban gypsies and Hippy chic are welcome! La Mangrove is more than a tipi accommodation and river lounge. It’s the culmination of our personal journey. 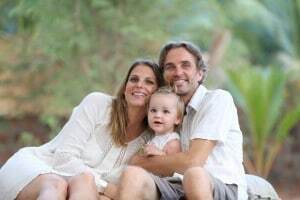 We, Maud (Dutch-German) and Thibault (French), started our adventure together nine years ago in Goa, where we fell in love with crazy and beautiful India, Goa and each other. Thibault, a music lover with green fingers, started travelling the world from an early age. His interest in the world inspired him to study geography and ecology in Paris and Pondicherry (India) before he got an ideal globe-trotting job in TV production and events. He finally decided to pursue his dream and to connect his knowledge with his passion: to realize a sustainable place in magic Goa. Maud studied international business communication and worked in the creative advertising industry in Amsterdam and Paris. She loves travelling to discover foreign cultures and as a consequence is multi-lingual. She relaxes by keeping up in fashion, photography, magazines and decoration, which is handy as this will all provide inspiration for La Mangrove and the shop. La Mangrove is the result of our combined spirits and passions: a stylish and friendly place. It’s the place we have been looking for ourselves since we started to travel in India. We will be more than happy to welcome you, make you feel at home, share our personal tips and experiences and provide you with all the information and service you need. La Mangrove is a place where you can truly be yourself. We welcome people from all ages, backgrounds and nationalities; from yoga lovers to party people, via lounge lizards to lazy loungers, you’re all feel at home here.